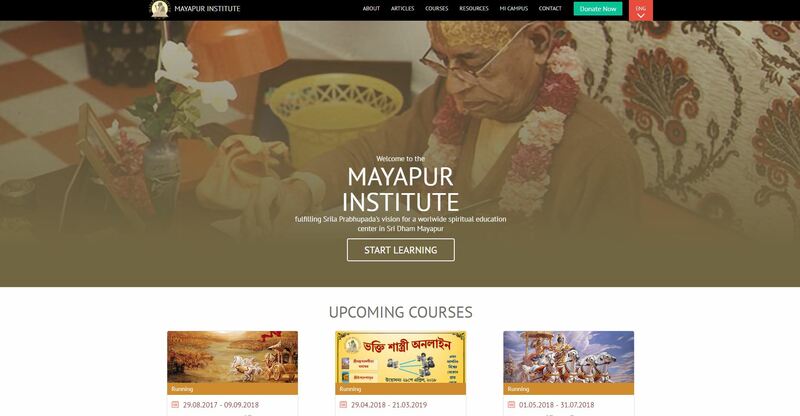 Mayapur Institute (MI) is unparalleled in the scholarship it imparts to its students in spiritual education and understanding of the Vedic philosophy and culture. Established in order to fulfill the above vision of founder acarya Srila Prabhupada, and in response to the growing need for the urgent dissemination of genuine Vedic knowledge for the enlightening of humanity, students from all over the world come here to acquire training in the practical skills and the exemplary lifestyle of the Vaisnavas, besides gaining academic education. Our student-centered programs focus on the assimilation of scriptural teachings, which comprises a systematic and scrutinizing study of Srila Prabhupada’s books, while simultaneously inspiring excellence in theoretical study. MI Offers various courses like Bhakti Sastri, Bhakti Vaibhava, Bhakti Vedanta, Teachers Training Courses, etc. Category Sastric Studies May 4, 2012 by ISKCON Desire Tree.